La Excelencia, eine New Yorker Band mit einer erfrischenden neuen Art, Salsa Dura zu interpretieren, schlug 2006 sensationell in die Salsa-Szene ein. Inzwischen gibt es ein 2. Album. Michael von Salsa-Berlin.De hatte die Gelegenheit zu einem interessanten Interview mit den Bandleadern Jos� Vazquez-Cofresi und Julian Silva zu sprechen. Michael: Jose, how did you became a Salsa musician? Michael: I like the cover of the new CD - a conga in the barrio. Please tell us about the idea behind the 'Tumbao Social'. Michael: Could you tell us something more about the band members? Jose: The band members are the same ones who record as well as play live... I believe that creates a strong bond in the studio amongst us and it comes through musically playing so many years together... La Excelencia is a New York salsa band even though our families root mainly from the caribbean except a few of the musician coming from different parts of the USA, Latin America, and one of our musicians that is from Japan... One thing I would like to say is that we are all brothers one big family it carries in our sound. 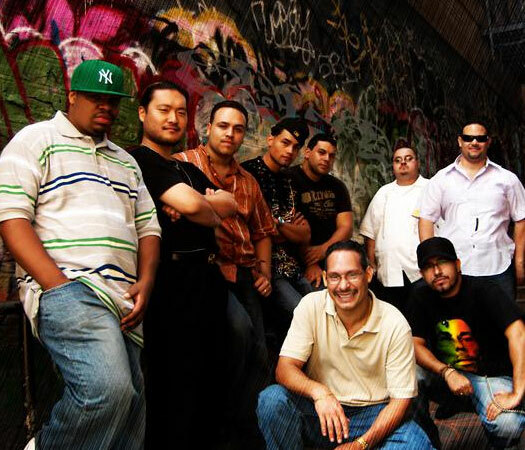 La Excelencia is made up by: Willy Rodriguez (piano), Jorge Bringas (bass), Charles Dilone (Bongo/Campana/Quinto), Jose Vazquez-Cofresi (Congas/Shekere), Julian Silva (Timbales, Cata, Clave, Maracas, Guiro), Ronald Prokopez (Trombone), Tokunori Kajiwara (Trombone), Jack Davis (Trombone), Sam Hoyt (Trumpet), Jonathan Powell (Trumpet), Willy Olenek (Trumpet), and Junior Beltran (Coros). Michael: Your Salsa is very unique. It hits the Salseros on the whole world when it first came out in 2006. Fresh, young, wild and a hard driven rhythm. How you found the way to this sound and why the name 'La Excelencia'? Jose: Our sound is developed from the streets of New York, most of us studied Afro-Cuban music and other forms of music that help developed our style... The name La Excelencia was created by Julian Silva for the band to intense the guys to live up to the name... Julian always says we may not be the best individually but as a team we are Excellent! Michael: What's in your opinion the difference between the first CD (2 years ago) and the 'Tumbao Social'? Jose: The difference between our first CD 'Salsa Con Conciencia' and this CD 'Mi Tumbao Social' is that we have matured more as musicians and and continue to learn as we continue our musical journey you can hear it in the sound and the quality of the recording. Julian did a good job in arranging the songs also to bring our live sound into the studio and the Engineer Kamilo Kratc did a great job of capturing it. All arrangements are written by Julian Silva except the bonus track written by trombone player Tokunori Kajiwara and pianist Willy Rodriguez of La Excelencia. Another difference in this CD is that everyone in the band is featured we show the strengths of each member at least once. 'Mi Tumbao Social' also shows different styles that the band can perform including a Bolero which features La Excelencia's vocalist Gilberto Velazquez & Edwin Perez doing a duo for the first time. Finally this is the first CD that Julian Silva and I (Jose Vazquez-Cofresi) split 50/50 compositions on on a recording. Michael: I read that you sold 9000 CD from your first release. That's not bad for an independent CD. But could you make a normal living with the money you and the band members earn as Salsa musicians? Jose: Yes we sold 9000 CD of 'Salsa Con Conciencia' and that number continues to grow, it does not count the digital downloads that have been over 4000 in downloads alone. At this moment in time we are still in the starting stages but I believe we will reach the level we want to live off of La Excelencia in do time... Do you have enough opportunities to perform? We have many opportunities to perform in New york City we are considered one of the hardest working bands, and no Europe has become our second home and thanks to our manager Johan Vrancken we continue to have a successful touring schedule. Michael: Last question: Which is your personal favorite song of the new CD and why? Jose: My (Jose) personal favorite song on the CD is "Unidad" because I believe it shows what Salsa Dura really is and the message of Unity is one that we are creating through our music. I can actually say I have seen many parts of the world that people would never believe that salsa would be played or dance that is definitely UNIDAD! Julian's favorite song is American Sue�o because the story touches so many people that have immigrated to so many parts of the world not just to America. Julian and I would like to thank you Michael Peters for being one of the first people to review our 'Salsa Con Conciencia' CD and being such a huge supporter and promoter of salsa music around the world. GRACIAS HERMANO! Michael: Thank YOU for the interesting interview ... and I wish you a HUGE success with the excellent new album!